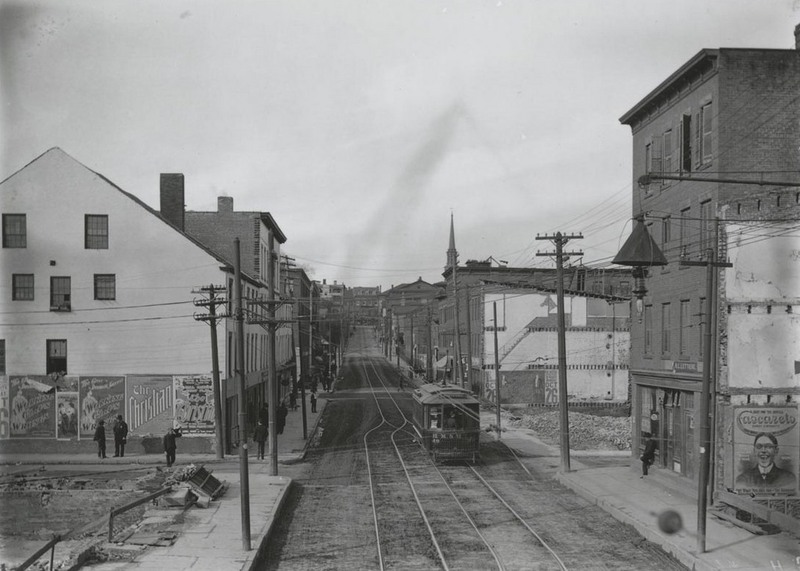 Looking west on Morgan Street from near the corner of Front Street (today’s Columbus Boulevard), on August 21, 1903. Image courtesy of the Connecticut State Library. The view just two months later, on October 25, 1903. Image courtesy of the Connecticut State Library. For many years, the only bridge across the Connecticut River at Hartford was here at the foot of Morgan Road, just behind the photographer. The original covered bridge that had been built here in 1818 burned down in 1895, and although a temporary replacement was soon built here, a more permanent bridge was in the works. The city ultimately chose a stone arch bridge, which was completed in 1908 and is still standing as the Bulkeley Bridge. As part of the project, they designed broad avenues on either side of the bridge, which required demolition along Morgan Street. In later years, further transportation improvements would reshape Morgan Street again. With the coming of the Interstate Highway System, this spot just west of the Bulkeley Bridge became the intersection of I-91, Connecticut’s primary north-south route, and I-84, one of the main east-west routes in the state. 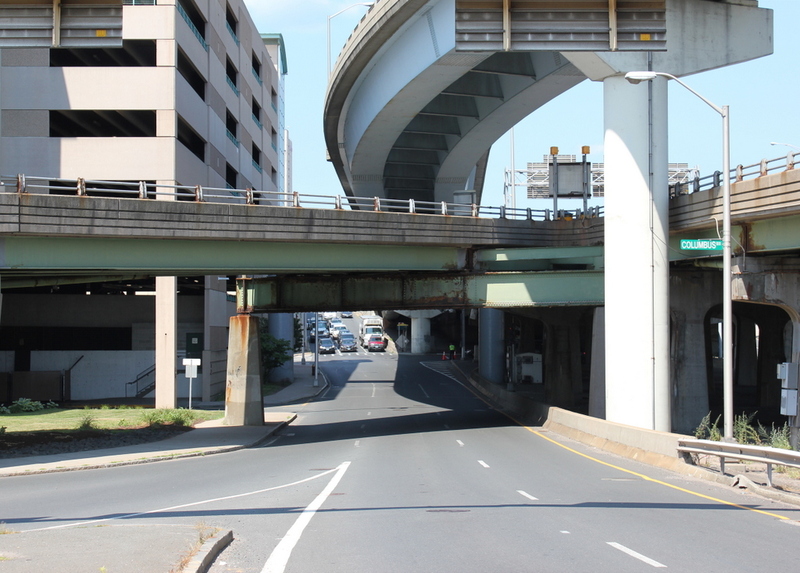 Any of the early 20th century efforts to make Morgan Street a grand boulevard were completely undone by the 1970s, when I-84 was built directly above the street. 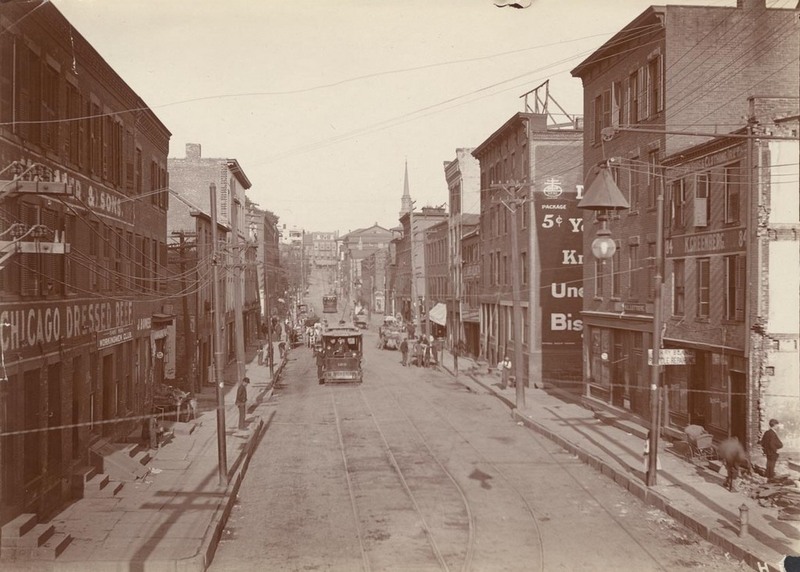 Today, instead of being lined with the tenement houses and merchant storefronts that once stood here, the street is now surrounded by parking garages and elevated highways.